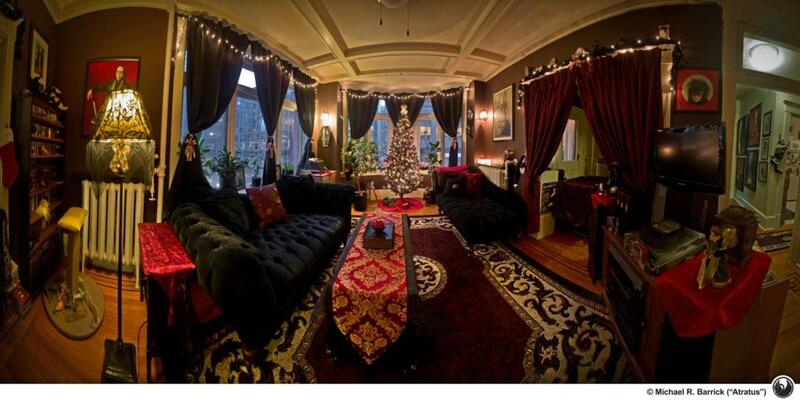 A 180° panorama of my little rented corner of the world, decked out for Christmas. Stitched from 34 photos, all f2.8, ISO 100, 1 second exposures, locked manual focus. Shot with an Olympus E-5 with Olympus Zukio 12-60mm zoom at 12mm. The full-resolution image is 15,542 px × 7,411 px. Photos were stitched in Photoshop CS4 with manual adjustments to auto stitching, levels adjusted in Lightroom 3.6 prior to stitching and rotation and distortion in the image modified in Lightroom on the resulting panorama.